As a native Minnesotan, I usually get a little disappointed or dismayed by the Twins concepts I see on the forum. 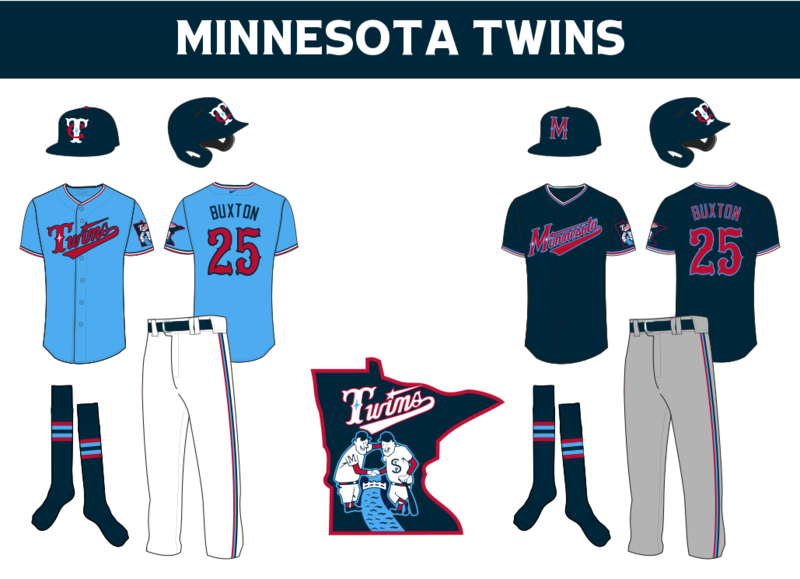 Their identity always seems like a bit of an afterthought, often subject to a recolor so as to differentiate the Twins from a myriad of RWB teams in the league. Instead of taking this approach, I wanted to work (for the most part) with the existing color scheme whilst drawing from the team's history. With that in mind, I reintroduced light blue into the color scheme. While light blue was restricted to their road uniforms in an era when several teams were using it for their road uniforms, this historical precedence combined with the fact the state's name literally means "sky-tinted water" makes it a suitable vehicle for setting them apart from teams with similar colorways. This addition of light blue spells the end for Kasota gold. I didn't necessarily hate its addition a few years ago, but its application was unsuccessful and does not fit with the light blue. One of the more popular changes for posters is to correct the inconsistencies between the team's wordmarks. I decided to follow suit, but took a decidedly different approach. The result applies the Minnesota Wild script to the Twins, using a Tuscan-esque font that takes cues from the area's history as a railroad and flour milling hub. The TC logo follows suit, and I put an M back on the away cap. Here, it calls back to the successful minor league Minneapolis Millers. Lastly, Minnie and Paul are updated with the new colors and wordmark as well as altering the state outline to be more geographically accurate. 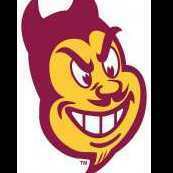 It is promoted to the primary, replacing the squad's generic baseball roundel. Got all that? Good. Now look at it. Let me know what you think. I also have a decidedly modern take on the Twins that I will post sometime in the coming week. Take care. That is amazing. Love the addition of light blue. Nice work. I really like this! Will you be doing the rest of the league as well? i love the use of light blue to separate them from the other navy-red teams. if i may suggest something, could we see a red bill on the home caps? YES! I am loving the Wild script on a baseball jersey. Very creative, but I think the script and number font is too "western" for the Twins. Bringing back the light blue works way better than the ugly mustard they have right now. There are few things I would press the buy button harder for than that baby blue jersey. Yeah I read it like that too. This is probobly my favourite Twins concept of all time. I love the addition of the Minnesota Twins type font and the idea of bringing back the light blue. 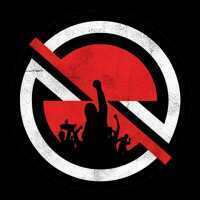 My my only critique is the hat logo looks a little to big. But other then that very well done. I also agree that the "n" in "Twins" looks like an "m." Other than that, this is fantastic. Thanks for everybody's comments and thoughts! This is my first real baseball concept, so I'm glad it got a good response and some suggestions that will be helpful moving forward. Honestly, I almost certainly will not be doing the rest of the league. I lack the free time and the effort for it, and I don't really have many ideas for other teams. I'm probably just going to sandbox Twins concepts and maybe some other stuff. I appreciate your interest though! I can see that, and could thin up the T a little bit. I ran into some problems making the logo because unless you're working with the Twins' flatter wishbone C, the interlocking gets really sloppy when the letters are similar sizes. This also emphasizes the T in Twins a little bit more versus the C, which makes sense because that's what they're named. May I ask for some clarification as to what about it doesn't work? 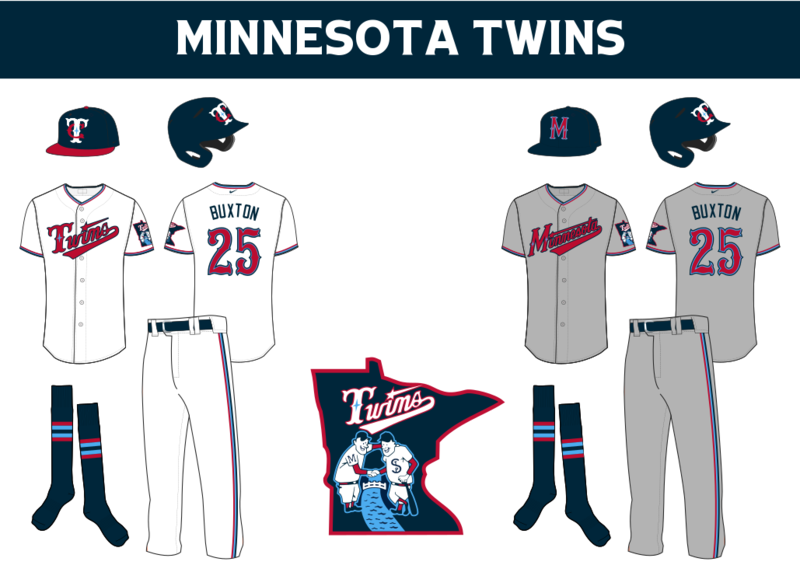 I personally think the Twins should have both an M and TC cap, and I liked the tie-in to the Millers M. I could probably just limit it to the navy alternate, though. Okay, I guess I can kind of see that. I constructed the Twins script directly from the Minnesota one, just making the line weights equal. What change would you suggest to remedy this? Thanks for the compliments. It is entirely possible that I made the cap logos a little on the large size and can fix that going forward. As always, let me know what changes should be made. Or shower me with praise. *gasp* Doug Dimmadome? 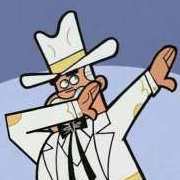 Owner of the Dimmsdale Dimmadome?